Helmed by English musician Ted Fletcher (who's worked with Jethro Tull, The Who, and other bands), Orbitsound's new T12 soundbar has a new way of creating pseudo surround sound—spatial stereo technology, they call it. 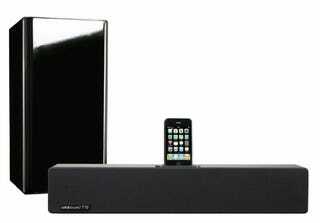 Instead of standing head-on from the soundbar like you normally would, the audio sounds just as good from anywhere in the room. I tried it out on a couple of Fleetwood Mac songs recently (no laughing, please), and it sounded just as good in the various points of the room I tried, with great bass levels. The T12 v2 apparently manages that all-round sound due to the positioning of the speakers inside the unit—with Orbitsound saying it's also some unique patents which they understandably don't want to tell of in too much detail. It hooks up to iPods and iPhones via the inbuilt dock, but also has a 3.5mm jack for everything else you might want to connect to it, plus an RCA port. In addition to the T12 soundbar, Ortbitsound has also revealed the T4 Radiopod, a DAB and internet radio/iPod dock/speaker combo with Wi-Fi and the very same spatial stereo technology which Orbitsound pioneered. Much more affordable is the T3 portable speaker, which has a really nice flat design and connects to MP3 players and iPods via the 3.5mm jack, with the same sound technology making the audio boom out in greater distances. Its battery can do around 10 hours of playback after charging.